Download Full Seminar report on the topic Fuel Cell Technologies in DOC format. The seminar report explains the Basic Principle Of A Fuel Cell Classification of Hydrogen Fuel Cells Stationary fuel cell systems Polymer electrolyte membrane fuel cell Phosphoric acid fuel cell (PAFC) and other systems with Technical and Economic Data. A fuel cell is a galvanic cell that efficiently converts chemical energy into electrical energy and useful heat. Stationary fuel cells can be used for backup power as well as distributed power. Modularity of fuel cells makes them useful for almost any portable application that typically uses batteries. Fuel cells have proved to be very effective in the transportation sector from personal vehicles to marine vessels. There are two important types of fuel cells, namely, hydrogen fuel cells and microbial fuel cells. This study will be focused on hydrogen fuel cells. These fuel cells directly convert the chemical energy in hydrogen to electricity. The only by-products of this reaction are pure water and useful heat. Hydrogen fuel cells are more efficient than traditional combustion engines and are pollution free, given that one has a source of hydrogen. A traditional combustion power plant is 33% - 35% efficient in generating electricity, whereas fuel cells have been known to be 60% efficient without cogeneration. In addition to that, fuel cell engines have fewer moving parts when compared to a traditional combustion engine, and this helps in their quieter operation. The Seminar Report also discusses the mechanism of Fuel Cell Systems and Hydrogen Engines for Automotive Applications. Further, The Seminar Report explains the Benefits Of The Fuel Cell Technology such as Stacks and systems, advantages and major issues of Hydrogen Fuel Cell. A fuel cell is a device that converts the chemical energy from a fuel into electricity through a chemical reaction with oxygen or another oxidizing agent. Hydrogen is the most common fuel, but hydrocarbons such as natural gas and alcohols like methanol are sometimes used. Fuel cells are different from batteries in that they require a constant source of fuel and oxygen to run, but they can produce electricity continually for as long as these inputs are supplied. There are many types of fuel cells, but they all consist of an anode (negative side), a cathode (positive side) and an electrolyte that allows charges to move between the two sides of the fuel cell. Electrons are drawn from the anode to the cathode through an external circuit, producing direct current electricity. As the main difference among fuel cell types is the electrolyte, fuel cells are classified by the type of electrolyte they use. Fuel cells come in a variety of sizes. Individual fuel cells produce very small amounts of electricity, about 0.7 volts, so cells are "stacked", or placed in series or parallel circuits, to increase the voltage and current output to meet an application’s power generation requirements. In addition to electricity, fuel cells produce water, heat and, depending on the fuel source, very small amounts of nitrogen dioxide and other emissions. The energy efficiency of a fuel cell is generally between 40-60%, or up to 85% efficient if waste heat is captured for use. 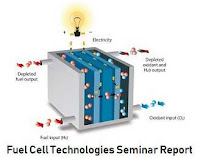 To get detail analysis and data on fuel cell technology download the seminar report.